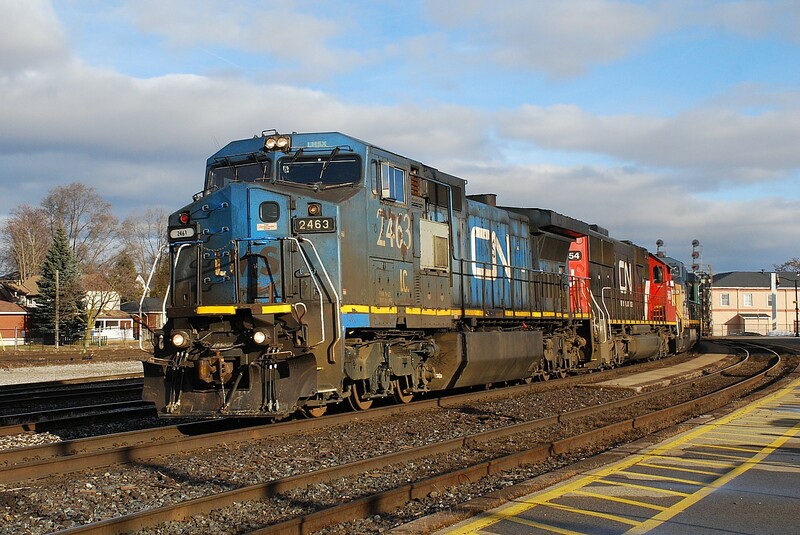 Railpictures.ca - Rob Smith Photo: The clouds parted just in time to let the sun shine down on all the beauty(!) that is IC 2463. The train would soon slow to a stop to allow 331 to complete crossing over ahead of them at Hardy, allowing 148 to continue eastbound on the south track. It was a hoppin’ 20 minutes in Brantford. | Railpictures.ca – Canadian Railway Photography – photographie ferroviaire Canadienne. Caption: The clouds parted just in time to let the sun shine down on all the beauty(!) that is IC 2463. The train would soon slow to a stop to allow 331 to complete crossing over ahead of them at Hardy, allowing 148 to continue eastbound on the south track. It was a hoppin' 20 minutes in Brantford. Yeah, I’d love to know the story behind the “LMSX” above the front window. This locomotive would be great for a “what reporting marks does this locomotive have” test.